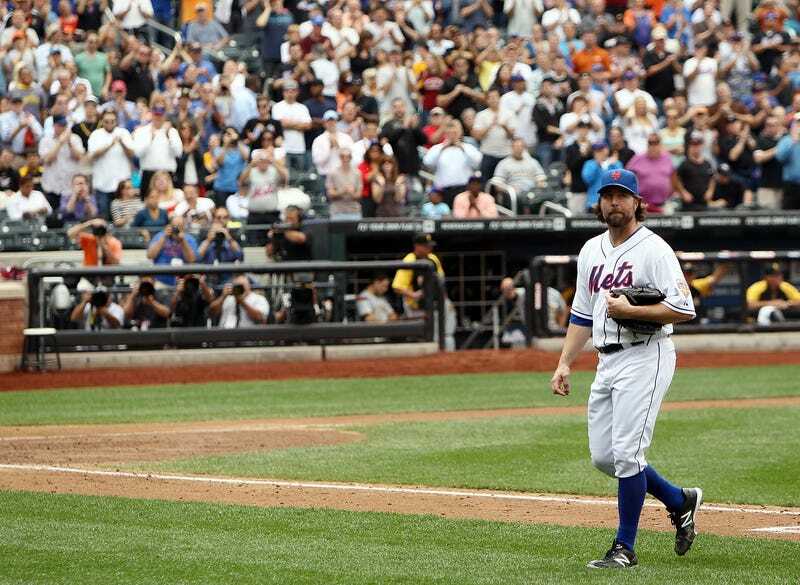 R.A. Dickey wrote a farewell letter to Mets fans this weekend, just as they always dreamed he would (it's in the Daily News instead of under their pillows, but you take what you can get), in which he thanked everyone from his old teammates to the head groundskeeper at Citi Field. It's a little maudlin, but it's also extremely gracious towards the Mets, despite everything, and R.A. proves once more that he's the preeminent writer and philosopher in the major leagues. There was a time when we had to resort to guys that did crosswords in the bullpen if we wanted to project our intellectual fantasies on to a pitcher—fans of a certain stripe should be happy that Dickey is still knocking around, even if he's no longer with the Mets. The Mets gave me that chance almost exactly three years ago, and I will always be grateful to them for that. Only God could've written the narrative that has played out in the three years since. That is what I want to focus on, and what I want to hold in my heart. I am not going to lie to you, though. The trade was hard for me at first. This is where my heart was, where I wanted to be, where I lived out a story of redemption and felt that every one of you shared it with me in some form or fashion. I loved pitching for you. I loved your passion, the way you embraced me from the start, and the way you seemed to appreciate the effort I was putting forth. Every time I'd walk off the mound after an outing, I'd look in your faces, the people behind the dugout, and felt as if all your energy and support was pouring right into me - even when I was lousy. It gives me chill bumps thinking about it even now.